The loss of one becomes the journey of many. When seemingly happy, travel-infatuated CJ Twomey violently ended his own life at age 20, his family was plunged into unrelenting grief and guilt. In a moment of desperate inspiration, his mother Hallie put out an open call on Facebook, looking only for a handful of travelers who might help fulfill her son’s wish to see the world by scattering some of his ashes in a place of beauty or special meaning. Twenty-one thousand strangers liked the Facebook page,and one thousand volunteers have since taken CJ to one thousand unique places around the world. While crisscrossing the globe, his ashes and his family’s story have given rise to a social media phenomenon — a worldwide community — that has congregated in solidarity and empathy in dealing with a still heavily stigmatized and misunderstood form of mental illness. Aggregating hundreds of clips chronicling personal ash-scattering pilgrimages worldwide, combined with intimate interviews and vérité filmmaking, Hallie’s story — one that has cross-pollinated and traveled so organically, resonantly, inspirationally — shows us that social media can act as a connector and a vehicle for empathy, as opposed to the more toxic aspects of social media interaction we’re currently witnessing. Her story further illustrates how there can be positive action grown from suicide, and that even if it isn’t reliably predictable, it just may in some cases be preventable. 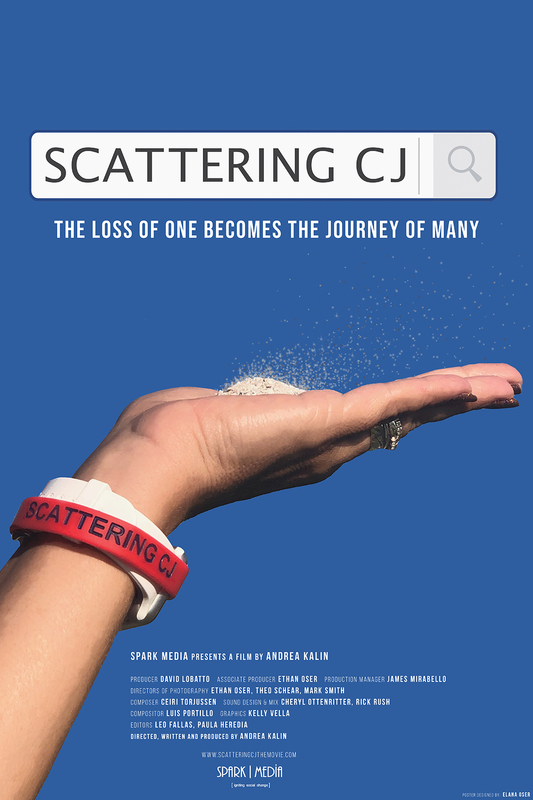 Scattering CJ is a film that confronts persistent stigmas surrounding mental illnesses. Mental illness and suicide are some of the most prominent issues facing individuals today; it is the 10th leading cause of death in the United States, and America’s overall suicide rate rose by 24 percent from 1999 to 2014. This correlates with far more dire mental health statistics as well: depression affects 20-25% of Americans ages 18 and up in a given year, but only half of all Americans experiencing an episode of major depression receive treatment. Worldwide, suicide rates have increased by 60% over the last 45 years. While tremendous progress is being made, both through political policy and because of the work of mental health organizations throughout the world, we believe that film can be a way to reach people in a visceral, direct way. We hope Scattering CJ will educate and connect people who might be grappling with feelings of loneliness, uncertainty, or mental illness themselves–or people who can become allies or sources of strength to those who think they’re alone. It’s so easy to forget to speak up or ask tough questions, and we hope to continue the difficult dialogue that Hallie has already prompted through her Facebook page. Join us and help upend the silence that often surrounds mental health issues. Visit the film’s official website at www.scatteringcjthemovie.com. Scattering CJ is scheduled for release in 2019.